The resolution, passed in July, states in Annex B that Iran will not "undertake any activity related to ballistic missiles designed to be capable of delivering nuclear weapons, including launches using such ballistic missile technology." Asked about the upcoming launch, a State Department official declined to speculate on whether the launch will violate the UN resolution. But the official said the administration is concerned about the potential to use it as a long-range missile. "Our longstanding concerns regarding Iran’s ballistic missile development efforts remain, and are shared by the international community," the official told the Washington Free Beacon. "If there are specific launches or other actions that are inconsistent with any relevant U.N. Security Council resolutions, we will address them through the appropriate channels," he added. "And we will continue to work with our partners, and take any necessary unilateral actions, to counter ongoing threats from Iran’s ballistic missile program." The Pentagon’s most recent annual assessment of Iran’s military, made public in June, said that Iran "paused" some areas of nuclear development during talks that resulted in the final Joint Comprehensive Plan of Action, but also that the Iranian long-range missile program is continuing. "Iran has publicly stated it intends to launch a space launch vehicle as early as this year (2015), which could be capable of intercontinental ballistic missile ranges if configured as such," the report said, without identifying the vehicle as the Simorgh. According to the one-page report, Iran "continues to develop technology capabilities that also could be applicable to nuclear weapons, including ballistic missile development." An intelligence official said the space launcher is assessed by intelligence agencies as being a covert ballistic missile, developed with extensive design, stage separation and booster equipment and know-how provided by North Korea. Contrary to Iranian government statements that the Simorgh space launcher is limited to carrying a 220-pound payload—too small for a first-generation nuclear warhead—the official said the rocket will be powerful enough to carry a large nuclear warhead if Iran develops one. "It’s assessed as having a fairly heavy lift capability," the official said. The Free Beacon disclosed in April that North Korea provided several shipments of missile components to Iran as the nuclear talks were ongoing. Intelligence agencies detected two shipments of missile parts to Iran from Pyongyang since September. North Korea conducted a test of what it said was a satellite launch Feb. 7, which the U.S. Strategic Command described as a test of a long-range missile. Space launch technology is identical to long-range missile technology. The main difference is the third stage of a missile contains a nuclear warhead that must be tested to survive the high heat of atmospheric reentry. Space launchers are used to place satellites or other payloads in orbit. North Korea reportedly has been developing a nuclear warhead that could be detonated in low-earth orbit to create a damaging electromagnetic pulse over wide areas. An Iranian space launcher capable of carrying a nuclear warhead into space could do the same. Michael Rubin, an Iran specialist at the American Enterprise Institute, said the Simorgh is a missile. "To believe that Iran's space program is about space is akin to believing its enrichment program was about medical isotopes," Rubin said. "The only consistent factor across Iran's various programs is that you can piece them together to create a nuclear weapons program," he added. The space launcher violated Iran’s commitment under U.N. Resolution 2231, Rubin said. "But so long as Iran knows that legacy is more important than national security for Obama and Kerry, they can rely on the fact that the lawyer in the White House will be siding with whatever story Tehran's spinmesiters craft," he said. Laura Grego, a nuclear specialist at the Union of Concerned Scientists, said the first Simorgh launch is expected this month. A lack of specifics in the U.N. resolution make determining if the launch will violate the resolution difficult, she said. "I’m not in a position to make such a judgment about a potential Simorgh launch," Grego said. "I can say from a technical, not legal, point of view that the Simorgh as described appears to be designed as a space launcher rather than a ballistic missile, and appears incapable of delivering a nuclear weapon over long ranges, but it does appear to use ballistic missile-relevant technology." Grego said the Simorgh is similar in size to the North Korean TD-2/Unha space launcher-missile, but with two stages. The TD-2 has three stages. Iran showed off the Simorgh during a military parade marking the anniversary of the Iranian revolution Feb. 11. 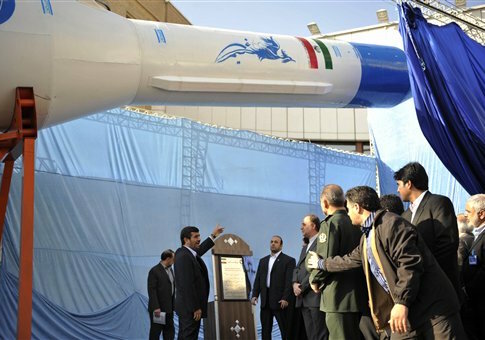 The space launcher was paraded along with Emad, Qadr, and Shahab ballistic missiles. Iran launched an Emad missile on Oct. 10, and a U.N. panel of experts said the missile test violated a 2010 U.N. resolution that bans Iran from developing nuclear-capable missiles.